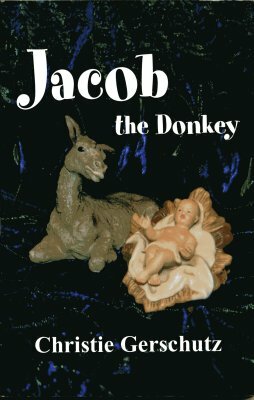 When a one year old donkey named Jacob was given to a young carpenter as a betrothal gift, he worried about a trip he would have to make to Bethlehem. To make matters worse, he learned that he would have to carry the carpenter's wife, who was expecting her first child, all the way there. With the encouragement of his animal friends, however, he not only made the journey to Bethlehem but also realized he had a very special role in another gift that changed the world forever. Ages 12 & up. 118 pgs. Jasper was really excited. He hadn't seen much of Kylie since she went back to school, but now they were invited to spend Christmas with Mr. Chaney and his sister, Louise, at their home in the next county. 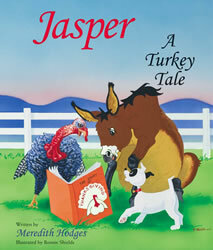 Jasper's excitment is compounded when he finds out he is to be in the town's yearly Christmas parade. But Mr. Chaney is nowhere to be found and foul play threatens to dampen the spirit of Christmas. Only Jasper and Moxie can solve the puzzle and save the day. Who was the little boy Moxie and Jasper found in the warehouse? Will Jasper and Moxie be able to save Christmas for the little town? What happened to Mr, Chaney? Join Jasper and Moxie as they play detective and come to terms with the meaning of christmas in this imaginative and exciting holiday story! 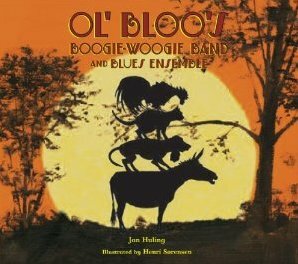 Great family book for all ages. Absolutley delightful full-color illustrations! 86 pgs. Ages 8 & up. Join Jasper and all his friends on another holiday adventure. 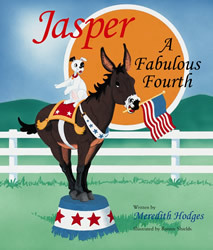 When Kylie and her father host a Fourth of July picnic for family and friends, Jasper and Moxie get a taste of freedom the whole gang will remember. Full color illustrations. 46 pgs. Ages 8 & up. Jasper loved his time with Kylie and Moxie. They always saw so many new things and had such great adventures together. Where was this special place they were going? Why was it so important to Ben? Would it make Kylie happy or sad? This would prove to be a very special day for Jasper. This was a day he would discover the secrets of the heart. 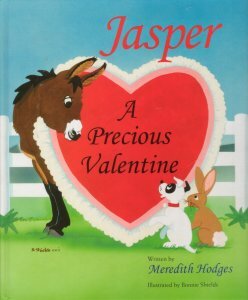 Jasper would take this Valentine's Day would reveal not only what hppened to Kylie's mother, but would also reveal to Jasper the many wonderful things that can come with love. Great family book for all ages. Absolutley delightful full-color illustrations! 81 pgs. Ages 8 & up. This latest holiday adventure finds Jasper, Moxie and the gang preparing for Thanksgiving. But near disaster threatens their plans, and Jasper and Moxie are stumped by a mysterious visitor. Join in the fun as the two friends try to solve the mystery and along the way, learn the true meaning of Thanksgiving. Full-color illustrations. 46 pgs. Ages 8 & up. Jo-Jo is a donkey and he does not like it, not one bit. Then, one dark and stormy night, Jo-Jo discovers that it is up to him to save the city from the sea. Cute full color illustrations. Ages 8-10. 46 pgs. Follow the adventures of Keikilani, the singing donkey, as she travels from the mountains to the sea on the Big Island of Hawaii. Keikilani goes to Kona Village where she gets into trouble. However she is a special donkey... she is a Kona nightingale... she can sing! 32 pgs. Ages 4-8. A happy Hawaiian version of a popular Grimm's fairy tale, The Bremen-Town Musicians. A donkey meets up with other animal friends on his way to become a musician in Kona-Town. 29 pgs. Ages 4-8. 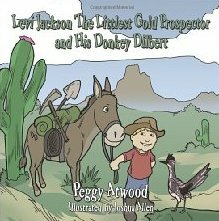 Levi takes his donkey with him as he and his grandmother go prospecting for gold in the river. Color. 17 pgs. Ages 6-9. When mama donkey goes out to see a film with Billy Goat, Nanny Hen comes to stay with Little Donkey. Little Donkey doesn't want to be left at home with a baby-sitter. 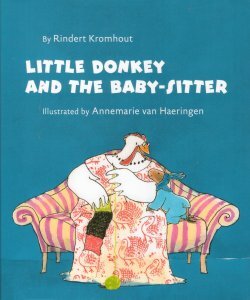 Luckily, Little Donkey comes up with clever plan to make the most of his evening in a story that will delight and entertain any child who has ever been left with a baby-sitter. Colorful Illustrations. 26 pages. Ages 4-8. It's Jackie's birthday and Little Donkey picks out the perfect present for him--a kite with a very long tail. Problem is, Little Donkey decides he'd rather keep it for himself. 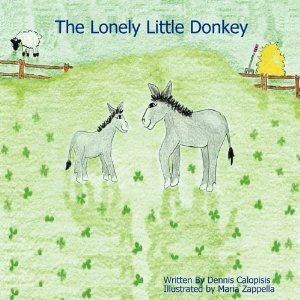 Children will relate to Little Donkey's dilemma in this tale with a happy twist at the end. Cute color illustrations. Ages 4-8. 32 pgs. Lyrical bedtime story. Join animals from around the world, including a donkey, a little monkey, some silly sheep, and an old black cat, as they end their busy days and close their eyes to sleep. The quiet rhyme of this bedtime poem will gently rock little ones to sleep. Cute color illustrations. 29 pgs. Ages 4-8. A young donkey's wish to be come fast and strong because the other donkeys tease her may come true. Great illustrations for a young reader and great to read to the family. 24 pgs. Ages 4-8. 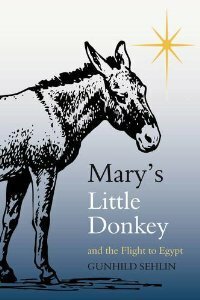 One night Mary & Joseph ask the little donkey to give them a ride to Bethlehem. He is afraid he will get them lost. He thinks they should ride a different animal. But not only does he reach Bethlehem, he finds a stable where Jesus can be born. Written in a poetic form. (Look for the frog on every page!) Very cute illustrations! 22 pgs. Ages 4-6. 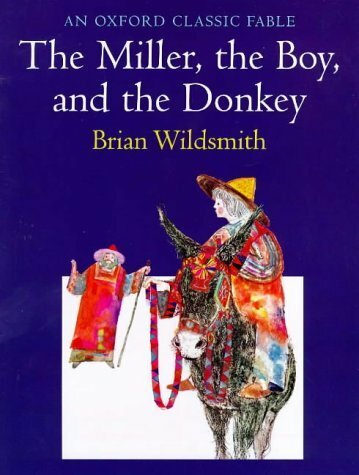 The miller decides to take his donkey to market & sell him. What happened on the way? 29 pgs. Ages 4-8. True story of a donkey named Eeyore at the Donkey Sanctuary. 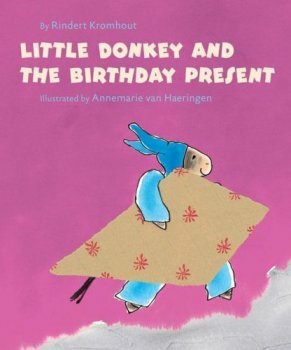 Eeyore, the naughtiest donkey in the sanctuary, continues to be naughty in this cutely illustarted book. 37 pgs. Ages 8 & up. Ever wonder what it might be like to be at the Bethlehem stable one starry night 2,000 years ago and look into the eyes of baby Jesus? This book takes you there, to the manger beside Mary and Joseph, and then on to other milestones in Jesus' life. 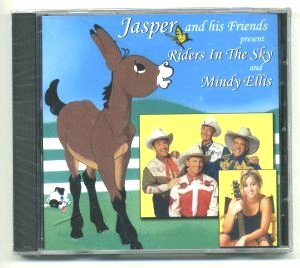 Through the eyes of Moses, a floppy-eared donkey and his master, Bullion, experience the wonders of being there when Jesus befriends Zacchaeus the hated tax collector, on Golgotha when Jesus dies on the cross, and in the Garden of Gethsemane when Jesus ascends into Heaven. For all family members. 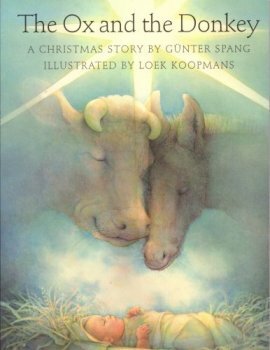 With the stunning illustrations, children can visualize and understand the wonderful story of Jesus and a floppy-eared donkey. 125 pages Ages 12 & up. Humorous story about Bill (a donkey) & his picnic with Caroline (a goat). Bill had a car. But he didn't have a job, couldn't tie a bow, and spent all day playing in his yard, and so no one believed his car was real. Caroline, believed him. Almost... A warm and poignant story about making a very important dream come true. 27 pgs. Ages 4-8. Anthony the Postman delivers the mail, but he doesn't drive a mail truck. He drives a train of mules from the top of the Grand Canyon to the town of Supai far below. 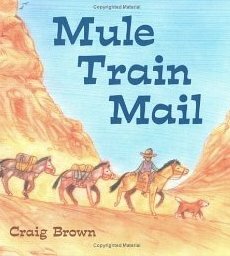 The mules carry boxes of mail down the steep trail. Ages 5-8. 40 pgs. 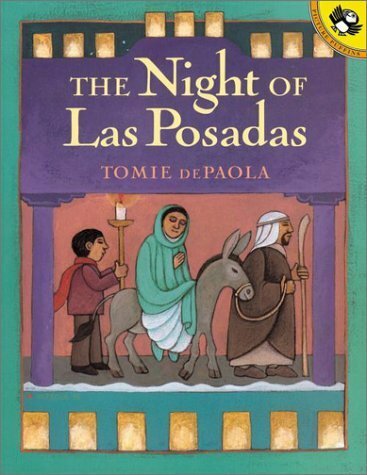 Christmas Eve in Santa Fe is celebrated by the traditional procession Las Posadas, until Angie becomes sick & there is a snow storm! Color paintings. Ages 4-8. Philo doesn't think that he is special. He thinks that he isn't important. He's just a donkey. Donkeys aren't known for doing great things. Philo learns that everyone's special and that he's not just any donkey. Illustrated. 20 pgs. Ages 4-8. Set in Louisiana, four aging animals who are no longer of any use to their masters find a new home after outwitting a gang of robbers. A take-off on Bremen Town Musicians. Beautifully illustrated in watercolor format. 32 pages. Ages 6-8. The ox and the donkey live together in a stable in Bethlehem, but they are not friends. The ox bullies the donkey, greedily gobbling up most of the hay. Then, one cold winter night, a Child is born in their stable, and, miraculously, the ox is transformed into a kind and generous companion. Color Illustrations. Ages 6-10. 24 pgs.